HomeNewsFDC urgues the public to join Besigye’ anti age limit removal campaign. 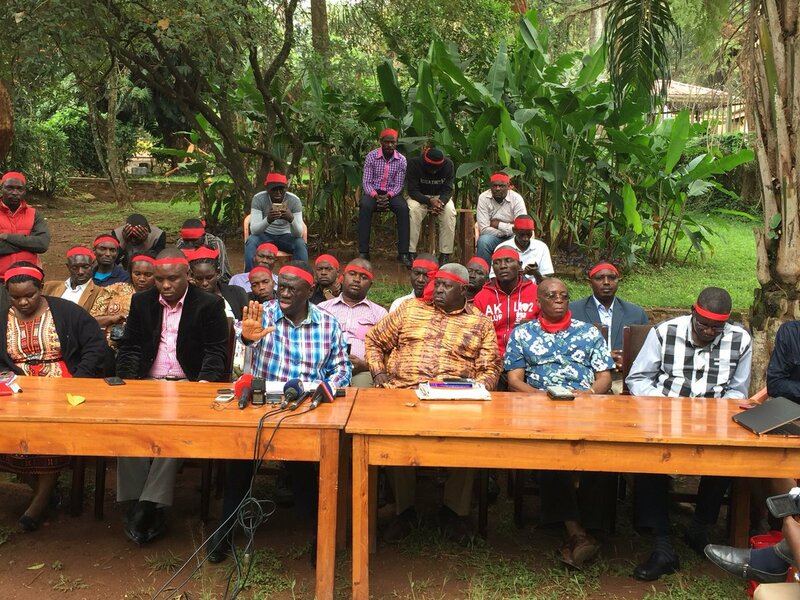 FDC urgues the public to join Besigye’ anti age limit removal campaign. Opposition Forum for Democratic Change FDC has associated it’s self with the opposition strong man Dr. Kiiza Besigye’ campaign of all Ugandans most especially the elites using public means of transport or walk to their work places and donning a red ribbon on their heads as a sign of protesting the removal of the presidential age limit and associating with ordinary Ugandans. This has been said by the party deputy spokesperson Paul Mwiru who revealed that as a party they welcome all efforts and actions geared towards stopping amending article 102b of the constitution which puts the presidential age limit at 75 years thus urging people to participate and not be speculators. He however revealed that the party acting president Hon. Alice Alaaso will soon unveil a one front of all the forces that are anti age limit removal since apparently they are in final stages. FDC also condemned the action of the speaker of parliament Rt. Hon. Rebecca Kadaga of surrendering the MPs to the strangers who happened to be the soldiers from the elite force. Mwiru asserts that Kadaga over threw the rules of procedures of parliament and constitution since she invited strangers in the chamber in addition to walking out and not monitoring the process of their eviction. FDC has also appealed to the suspended MPs not to adhere to police summons since they are protected by the parliamentary privilege and immunity act adding that it’s only the parliamentary discipline committe entitled with such duty. Mwiru further says the state minister for works Gen Edward Katumba Wamala owes the country and the Mityana municipality legislator Francis Zaake Buteebi who he punched an apology. It should be noted that last week the Igara west MP Raphael Magyezi Was granted leave of parliament to prepare a private members bill to amend article 102b of the constitution which puts the presidential age limit at 75 years after the speaker suspended 25 legislators which caused the uncalled fight between legislator and their brutal arrest of those that opposed the motion later the walk out of opposition MPs in protest.